We live on Lake Hartwell in northeast Georgia. The dam at Hartwell is located near the confluence of the Seneca and Tugaloo rivers. When they join, it becomes the Savannah River, which continues on down and forms the Atlantic Ocean. 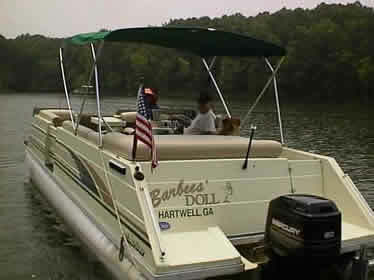 Lake Hartwell is 660 feet above mean sea level at full pool and the surface area is about 56,000 acres. The shoreline is about 960 miles long. My life has been spread among growing up, a Navy career, a civilian career, and (finally) retirement. Click to see a little about each. Thanks for visiting this website. To contact me, please send e-mail.